Civic leaders, artists and others crowded onto a spacious third-floor rooftop to watch Saturday’s formal unveiling of a 52-foot long, 14-foot high mural depicting a 1909 Hermosa landscape, painted along the eastern wall of New Orleans Café on Pier Avenue. On hand at the afternoon gathering atop the 200 Pier office-retail complex, across Manhattan Avenue from the restaurant, were muralist Chris Coakley and daughter Janet Coakley, 26, who is shown in the mural, pouring out the central image from a paint bucket. Father and daughter are Hermosans. The unveiling ceremony, in which a big blue tarp was lowered to reveal the mural, marked the second of 10 such art installations planned by its sponsor, the nonprofit Hermosa Beach Murals Project. The first of the Murals Project installations, painted by Art Mortimer on a north-facing wall of the downtown municipal parking structure, depicts a view of the downtown area in about 1924. 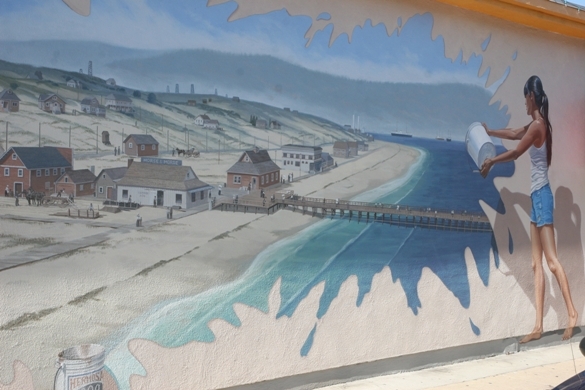 Coakley’s mural, broadly visible to strollers westbound on Pier Avenue, shows features of bygone Hermosa including the city’s old wooden pier, which stuck out about 500 feet over the ocean, a lumberyard, and a handful of businesses and homes.